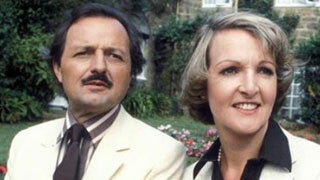 Peter Bowles appeared in his first television show in 1959, but it wasn’t until 1979 that he became a fully-fledged celebrity, after appearing in To the Manor Born, playing Grantleigh Manor’s nouveau riche owner, Richard DeVere. Although the series ran just three years in the U.K., ending in 1981, Bowles has continued to maintain his celebrity status with frequent appearances on stage, television and most recently the big screen. In the last few months, in fact, Bowles has been prominent in all three mediums – not bad considering he’ll turn 82 in October! Last December, Bowles made West End history when he became “the oldest leading man in British theatrical history,” when he opened a four month run in a new stage version of The Exorcist, where he played the title role. Meanwhile on this side of the pond, the 6’4” Bowles warmed up our winters, when he graced our screens on Sunday night’s as the Duke of Wellington in the Masterpiece presentation, Victoria. Then, at the end of March, Bowles was appearing on the red carpet at the opening of his latest film, Together. In Together, Bowles plays Philip Twain, whose wife Rosemary is taken to hospital for a routine procedure, which leads to the couple being separate for the first time in their 60 year-long marriage. 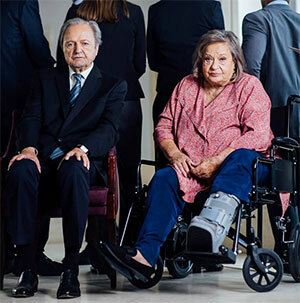 The separation becomes permanent when Philip is admitted to a care home and, after being released from hospital, Rosemary is not allowed to move into her husband’s care home. Sylvia Sims plays Bowles’ wife and the film, which was inspired by a real-life story, also stars Nina Wadia who played Zainab Masood in Still Open All Hours. In real-life, Bowles has been married to his wife Sue for 58 years. The couple met at drama school when she was 16 and Bowles was 18 . 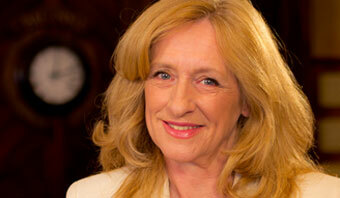 You can also see Bowles weekday afternoons in To the Manor Born, which airs at 2pm on MPT.